How apt that the culmination of the first day of the RSC’s Big Director’s weekend should end with a preview of Sam Kenyon and Erica Whyman’s Miss Littlewood. And what a treat it was. Performed on the beautifully intimate thrust at the RSC’s The Other Place in Stratford Upon Avon, where a mock platform slides back and forth from behind the pros arch to become the meta-stage for Littlewood’s story. The evening tiptoes down the path behind theatrical pioneer, Joan Littlewood, dabbling in the highlights of her working and personal life and drawing on autobiographical material, with a suitable touch of bias that is not permitted to go unnoticed. The set is not lavish but deceptive in its seeming simplicity and put to good use through the incredible number of transitions that Whyman has wrestled into refinement. Whyman’s direction is thorough and impressive. The cast are kept busy and are endlessly resourceful. Actor-musicianship and multi-rolling are showcased with a superb sense of tongue-in-cheek, not least by the talented supporting cast including Amanda Hadingue, who takes on a number of male and female cameos, while adding musical accompaniment on her violin. 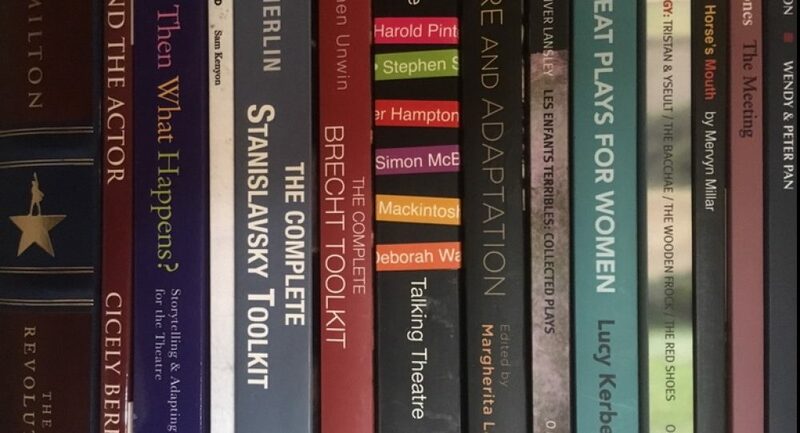 There is more than a touch of Brechtian influence and an honest reflection of the theatrical economy that Littlewood employed in branding the revolutionary Theatre Workshop style. Having said this, the attention to authenticity in the time-appropriate costumes was a real credit to the Wardrobe department and I can’t begin to imagine how many shoes were used in this production, not least by the delightful Emily Johnstone in her ever-changing roles. An honest reflection of the theatrical economy that Littlewood employed in branding the revolutionary Theatre Workshop style. Littlewood is played by seven actresses in total. Each superb in their own right and supported by a small but well-versed ensemble company. True to Kenyon’s script note, the seven Joans ‘should be diverse in a number of ways – age, ethnicity, appearance, accent -and no one should be concerned about doing an impersonation’. Each assumes the role through the gestic application of a hat (‘a costume. Or a weapon.’) and delivers their character as directed by the real Joan (played by Claire Burt with tenacity, scrutiny and a naughty twinkle in her eye) who presents her life as she wants to see it, even attempting to avoid the moments she wants to forget. Each Joan represented a different era and was charmingly replaced with the same careless attitude that the real Miss Littlewood adopted in recasting her plays at the last moment. Their harmonious co-existence was a lesson in depth of character as each actress presented so much more than just one of the multi-facets of Joan and served to remind us that Joan Littlewood was a representative of the people, an anybody, with a desire for theatre to be seen by and represent every man and woman. Kenyon, no doubt, had a battle selecting what to keep and lose from Littlewood’s dense biography. While some audience members felt aspects were missing, the teacher in me was delighted to see this inspirational figure immortalised in a production that reflected her own working style. A beautiful homage and a great resource to future generations of theatre makers. A beautiful homage and a great resource to future generations of theatre makers. Although dubbed ‘a new musical’, I fear that musical theatre fans would be disappointed. The songs are poignant but not moving and some of the individual singing voices are full of character but not finesse. This is not a criticism – style over substance fits the bill here and, like the era-influenced dance routines, the audience can enjoy the lightness of touch rather than an over-choreographed showcase. Littlewood was a fabled communist after all: ‘Profligacy is in bad taste’, offers Joan 2, flirting with language. Miss Littlewood runs until 4th August 2018 at The Other Place, RSC, Stratford. This entry was posted in Theatre Reviews and tagged actor-musicianship, Amanda Hadingue, Brechtian, characters, Claire Burt, directing, director, Emily Johnstone, Erica Whyman, gestus, Joan Littlewood, Littlewood, Miss Littlewood, multi-role, musical theatre, new blog, new musical, review, RSC, Sam Kenyon, stage, Stratford, The Other Place, theatre, theatre maker, theatre review, Theatre Workshop by Ginny. Bookmark the permalink.